We are describing in full details in what way the system of the US tourist visa receiving works for Ukrainian citizens. Please, read attentively to be aware and avoid a fraud. A trip to the United States is a cherished dream for many citizens. Tourists dream of coming to this country to take just a quick look at the famous Hollywood Hills, to walk the red carpet and pay a visit to Mr. Trump in the White House. At some point in time of your acquaintance with the Ukrainian women of the dating sites, you make a decision of meeting them in real life. Most American men do not keen to go to Ukraine. Therefore, they organize tours to the US for their Ukrainian girlfriends. Moreover, here is a whole array of questions such as a deception and fraud, obtaining a Ukrainian passport, completing the Form for the US visa, an appointment for the interview at the embassy, terms of issue, prices, refusals, etc. Many citizens are scared of problems in the US visa obtaining. However, the thing is not as complicated as it seems. Submission of documents / visa appointment. The first step is an assessment of your readiness to work upon the preparation of documents and your general adequacy in the eyes of the visa officer. Imagine your granting a visa to yourself. What questions may arise? Follow up each of them. If you have a good visa story, and you have visited several countries – now you are ready to rush in fight, then – go ahead! The embassy’s websites supply rather detailed information but anyone can easily twist one’s neck in two seconds there, so we have prepared a collection of useful links. The next step is to complete DS-160 Form. All questions are in English but everything will go smoothly with a translator. The questions are divided into several types: personal (who are you/what are you), about your trip (when/where/what for/ in the collation of questions about flights you may write down any you have found on the airline ticket aggregator websites), about your relations and relatives and a question such as do you happen to be a terrorist? Answer the questions unhurriedly. Your answers will be automatically saved if required you may go back to the previous paragraph. Give special attention to the address where you are probably (or really) going to stay at the point of arrival ( in New-York suppose). It can be clarified while submitting documents and in any case you will be asked about it during boarding an aircraft in Kyiv. What is the cost of US visa for Ukrainians? So, go on. Upon completing the Form, you have to pay your visa fee, which amounts to 160 US dollar per a tourist visa for the Ukrainian citizens. To pay your visa fee you have to load and print out the receipt. Holding the receipt in your hands, you should walk to the nearest branch of the bank and pay 160 US dollars converted into Ukrainian Hryvnia, and then you receive a receipt with 18-digit code, which is to be checked! Pay attention to the fact that a bank cash office is working until 17.00 so do not be late! If you have the code of the completed Form and the code of the receipt, you may schedule the document submission (that is the visa interview) to US consulate. That is all. You have scheduled an appointment for your interview. Now it is the time to strengthen the defense – to collect all possible documents to confirm your connections with the Motherland: a statement of employment ( if you do not have any job ask your good friends to “employ” you temporally and issue a statement with a substantial salary stated in), a statement of your account activity (borrow the amount from your friends, put it in the account, take the statement, withdraw the money from the account and return it), document confirming your ownership rights to the accommodation, motor vehicle, copies of the previous visas and so on. All these papers are required to be on the safe side, because none will go through your documents with 99% probability. They will look at your passport and your face, which will answer any questions loud and clear. It is not necessary to translate the documents and statements in English. It is believed that while receiving a tourist visa, you do not have to demonstrate your knowledge of English it could cause a suspicion (what if the applicant will wish to remain in the United States). Interview. As soon as you have completed the Form and scheduled an appointment for the interview, two documents will be sent to your e-mail: Confirmation (PDF file) with your photo and Appointment Confirmation. You should bring these two documents to the interview. You are not allowed to undergo the interview without them. Come half an hour before the appointed time. 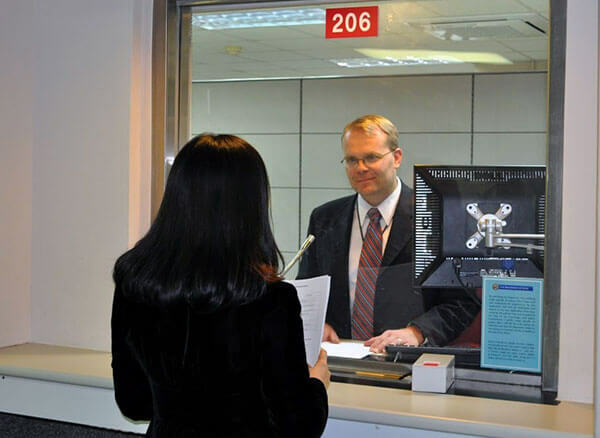 While entering the embassy you must have a transparent folder with documents, the passport, and your photo on the CD. That is all. Do not take any backpacks or bags with you; leave them outside with your friends or in the luggage room for 30 UAH. Having passed the multi-level security service you will receive a ticket with a number and wait for your turn. When you come to the window with a visa officer, do not worry, explain the purpose of the visit clear; tell a lie confidently if you are going the “fake” route, etc.- the facts must coincide. If there are any problems, the visa officers speak both English and Russian fluently. In 5-7 minutes of interview, you will know the verdict. If you get a turquoise card, you will likely get the visa. Have you got another card, there is nothing wrong in it, try the next time. If everything OK, your passport will be served to the address of a delivery service in a couple of days (you choose the address of delivery service yourself). One last thing. The term of an ordinary tourist visa for the Ukrainian citizens is 10 years. However, the frontier guard determines the period of stay on arrival in the United States (usually it is 6 months). You can check the exact duration after crossing the border here: https://i94.cbp.dhs.gov.